1 Bedroom: 1 Queen This apartment features open plan living and are individually furnished. Enjoy your own garden while relaxing on your sun lounge. Walk across Vasey esplanade an your immediately on the beach. 1 Bedroom: 1 Queen Each apartment features open plan living and are individually furnished. Every apartment has expansive ocean views and extra spacious outdoor balconies ideal for entertaining or relaxing. 2 Bedroom: 2 Queen or 1 Queen and 2 Singles This apartment features open plan living and are individually furnished. Enjoy your own garden while relaxing on your sun lounge. Walk across Vasey esplanade an your immediately on the beach. 2 Bedrooms: 1 Queen + 2 Singles, or 2 Queens. Each apartment features open plan living and are individually furnished. Every apartment has expansive ocean views and extra spacious outdoor balconies ideal for entertaining or relaxing. 3 Bedroom: 2 Queens and 2 Singles This apartment features open plan living and are individually furnished. Enjoy your own garden while relaxing on your sun lounge. Walk across Vasey esplanade an your immediately on the beach. 3 Bedrooms: 2 Queens + 2 Singles. Each apartment features open plan living and are individually furnished. Every apartment has expansive ocean views and extra spacious outdoor balconies ideal for entertaining or relaxing. At Meridien at Trinity accommodation, the Coral Sea & the palm fringed beach are right on your doorstep. All our apartment accommodation overlooks the breathtaking Coral Sea. 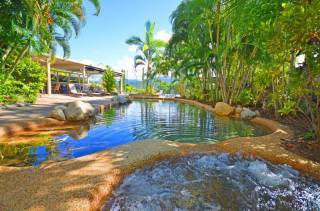 Each with huge balconies – luxury accommodation on the beach at Trinity Beach, Cairns Northern Beaches. All apartments are self catering and individually furnished, full kitchens, laundry facilities, ceiling fans, air conditioning including bedrooms, spa bath. Main bedroom with ensuite, 2 or 3 bedrooms apartments with 2nd bathroom. Being just 20 minutes outside Cairns, Trinity Beach is positioned between two headlands is an idealistic tropical location for a holiday experience to remember. The unique village ambience of Trinity Beach is yours to enjoy. Al Fresco dining, on lazy tropical afternoons. A beach swim or a dip in our solar heated pool & spa. Take a moonlight wander along the beach or a casual walk to a local restaurant on a balmy evening. Conveniently close to all the major attractions of Tropical North Queensland including the Great Barrier Reef, the Daintree Rainforest, Wildlife Parks, Kuranda Train and Skyrail, acclaimed Golf Courses, Bungy Jumping, Spas and much, much more. Tours and Attractions can be booked FREE from the in­house tour desk at Meridien at Trinity. Contact Alan & Judy whose boutique personal service will ensure your stay is a memorable one. Trinity Beach is one of Tropical North Queensland's favourite beaches. Being couple and family friendly we look forward to welcoming you to Meridien at Trinity. 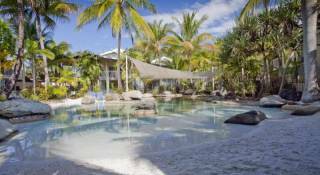 The Cairns region is famous for its tropical lifestyle and natural attractions including Australia's Great Barrier Reef, the Daintree, world heritage listed tropical rainforest, the scenic Skyrail, (the world's longest gondola ride) and the historic Kuranda Railway. Adventure activities include white water rafting, hot air ballooning, bungy jumping, ATV motorbike rides, Crocodile farms, the Safari Park with the largest pride of lions in the Sthn Hemisphere, 4WD safaris and much, much more ... And then we have water activities like Scuba, snorkelling, sailing, cruising, fishing etc or just relax in our magnificent tropical setting. Children under 2 stay free when using existing bedding. Cot, High Chair and Stoller hire is available contact Meridien directly. Balance of accommodation Due and Payable on arrival. For non arrival or if a portion of accommodation is cancelled after arrival the total cost of accommodation must be paid. A valid Credit Card must be suppied after booking. No Cancellation policy applies. Travel Insurance is highly recommended. Trinity Beach is situated approx. 15 minutes North of Cairns Airport along the Captain Cook Highway towards Port Douglas - the 8th roundabout - next one past Trinity Park. You may prefer a personal airport pickup, if so contact us with your flight details minium 7 days before arrival. Taxi and bus service, hire vehicles etc are readily available. Car hire can be arranged by us. or alternatively we can arrangea personal pickup from the airport. Local tours and cruise transfers and pick ups from Trinity Beach can also be arranged. Meridien at Trinity is located between Vasey Esplanade and Moore Street. Reception is at 26 Moore Street. Turn right into Moore Street in Trinity Beach and go up to the top of the hill.